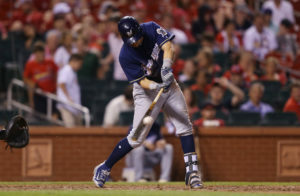 Hernan Perez and Eric Thames clubbed solo home runs to lead the Milwaukee Brewers to a 3-2 win in the rubber game of their three-game series at Busch Stadium in St. Louis on Wednesday. Jonathan Villar’s RBI groundout in the fifth proved to be the difference. Junior Guerra was called up from the minors and pitched 5 1/3 innings, allowing a run on four hits for his first win of the season. Matt Albers got the final two outs for his first save. The Cardinals made it interesting in the ninth inning. 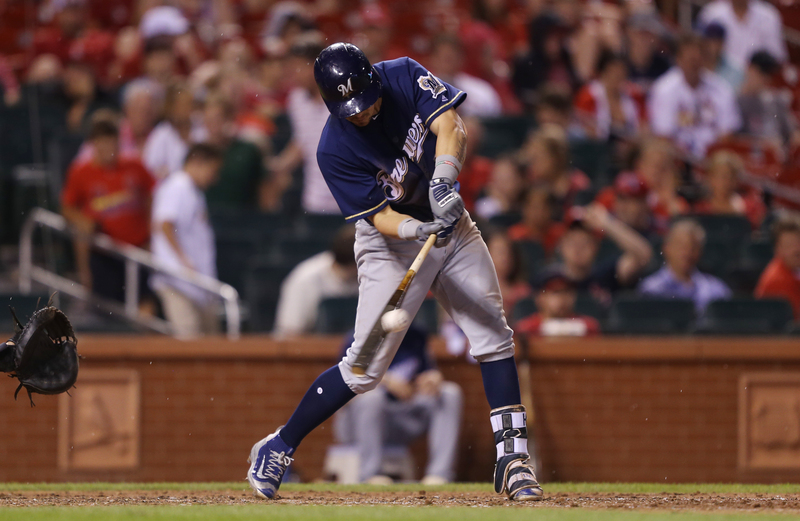 Trailing 3-1, Tommy Pham led off the inning with a solo home run off of Brewers left-handed reliever Josh Hader. Hader then struck out Matt Carpenter before giving way to Albers. Adam Wainwright gave up three runs in seven innings but fell to 0-2. He entered the game with a 15-8 record and 2.31 ERA against the Brewers in his career. The Cardinals played without starting catcher Yadier Molina who decided to accept the one-game suspension levied against him for his role in a skirmish with Arizona manager Torey Lovullo on Sunday. The Brewers get Thursday off before opening a 3-game weekend series in New York against the red-hot Mets. New York has won eight straight and entered the day on Thursday with a 10-1 record. Adam Wainwright had struggled to an 0-3 start for the St. Louis Cardinals. He started his turn-around in Milwaukee last night and held his own cause with the bat in a 6-3 Cardinals victory over the Brewers. Wainwright clubbed a two run home run in the third inning, then added a two run single in the fourth, driving in four of the Cardinals six runs. On the mound, Wainwright held the Brewers to a pair of runs on six hits while striking out nine over five innings. 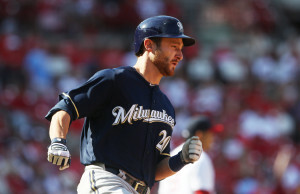 Aramis Ramirez drove in runs with a home run and double and Jonathan Lucroy helped knock Wainwright out in the 6th with a bases loaded three run double to lead the Brewers offensively. Wainwright entered the game with a 13-5 record and 1.92 ERA. But he hasn’t been able to solve Ramirez though. Aramis now has three home runs, eight doubles and eight rbi’s, to go along with a .415 batting average against Wainwright. 6 2/3 innings to win his fourth straight start. He’s given up two or fewer runs in all four, a stretch that started against the Cardinals back on July 13. In three starts against the Cardinals this season, Peralta is 3-0 with a 1.35 ERA. Zach Duke’s string of 16 consecutive scoreless outings ended when he walked two hitters and both scored on an extra base hit by Matt Carpenter. That made the score 7-4, so Brewers manager Ron Roenicke went to Francisco Rodriguez to get the final out and record his 32nd save of the season. The Brewers moved 3-games up on the Cardinals in the National League Central with the victory. Pittsburgh is 2 1/2 games behind the Brewers.